After the run from Port Hardy to Winter Harbor the Ucluelet leg is the longest run of the VI360 -- 138nm to Ucluelet. Navigationally it is a relatively simple leg -- start, go around Brooks Peninsula, then bee-line it for Uki. 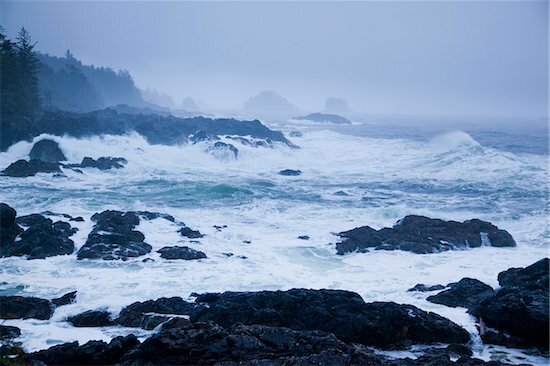 Unfortunately the Brooks Peninsula as a well deserved reputation as being the windiest & roughest place in the eastern Pacific Basin -- Brooks Peninsula is a stubby 9-mile (14-km) finger of land that juts out into the Pacific Ocean on the west coast of Vancouver Island, northwest of Kyuquot. 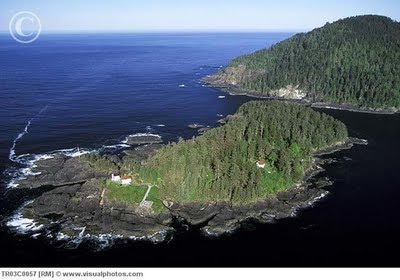 This peninsula is unique in that it is the only part of Vancouver Island to escape glaciation, and today produces plant species found nowhere else. For this leg the start was off the Kains Island lighthouse. Because gale warnings were predicted the race committee decided to start the fleet at 7:00am in order to give the boats a chance to get around Brooks before the seas built. We had a great start and literally romped out towards Brooks - eventually putting up our Code Zero to get out of a light spot while the rest of the fleet ended up getting stuck at Lawn Point. The wind and seas weren't too bad at Brooks, but steadily built to 20-25 knots and 8-12 foot seas as the day progressed. We ended up heading about 20-30 nm out with the wind on our nose as we beat our way down the course. In the back of the fleet there were lots of problems -- Makika hit a whale and lost their rudder; Turricum blew out their mainsail; Dark Star blew out a window and started taking on water; White Cloud (later renamed Brown Cloud) shattered their holding tank - just to name a few. In was rough and uncomfortable as we drove the boat hard upwind in the pitch darkness. All you could do was to hang on as we slammed at 10 knots into the heavy seas. In the end it was a battle of attrition -- at one point one of the boats started taking on water and they headed for the beach expecting to need rescue. After radioing in their mayday they started bailing -- during a break they looked behind and 300 yds behind them was the Coast Guard Cutter quietly shadowing them ready to lend assistance. This gave them the confidence to proceed. This was a night that went on, and on, and on -- in the end we finished well ahead of all the other mono-hulls but we were so tired that we needed Coast Guard assistance to thread the needle into the Uki channel taking a hard earned 1st place for this leg!